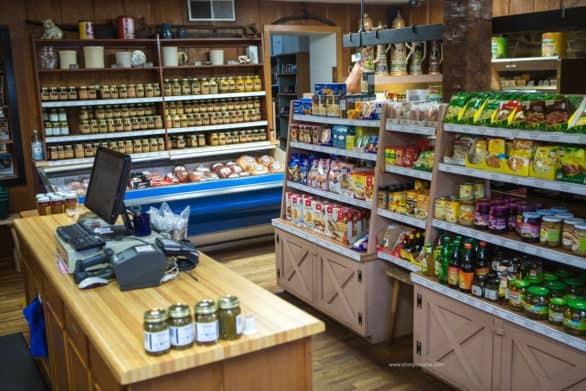 The Amana Colonies is a group of small towns in Iowa connected by a rich heritage present today in shops, museums and restaurants. It’s one of Iowa’s largest tourist attractions, drawing in history buffs, wine lovers and antique collectors. For families thinking of visiting with small children, it’s a great opportunity to explore a little American history in a welcoming environment. And, you can enjoy good food there. 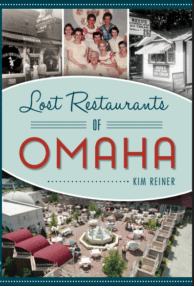 For the purpose of this post, I’m sticking with restaurants in Amana, Iowa. 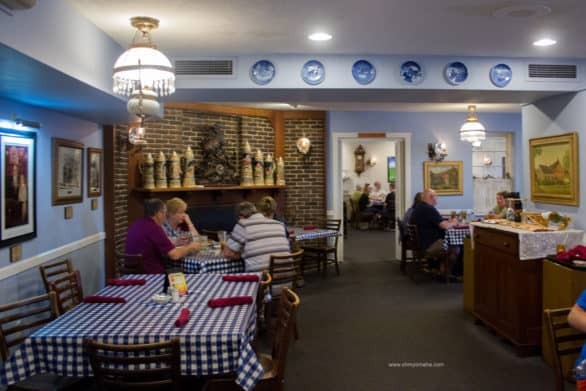 We spent the most time in that town, and it’s home to the heavy hitters of family-style Amana dining: Ox Yoke Inn, The Colony Inn and the Ronneburg Restaurant. I’ll tell you about Ox Yoke and Ronneburg (I never made it to Colony Inn). Ox Yoke Inn was our family’s favorite restaurant in Amana, Iowa. If you dine just one place, make this the one. We had dinner here on our first night and it set the enchanting tone for the weekend. Our server, Rhonda, was so incredibly welcoming, and offered a history primer in Amana and its tradition of communal living. Stuffed after the family banquet feast at Ox Yoke Inn in Amana, Iowa. The fried chicken was the clear favorite with the kids. We ordered the family banquet – and feast of three entrees, two cold salads, bread and strawberry jam, vegetables and potatoes. We overate, and it was worth every strained waistband. The kids devoured the fried chicken and green beans, and of course, the chocolate pie we split at the end. I recommend smearing that strawberry jam on your bread – it was the best jam I’ve ever had. And the potatoes were so good, and probably had to do with the generous amount of butter used. A peek at one of the dining rooms at Ox Yoke Inn. Meals are served family-style. They serve local wine and beer, and I’d recommend trying the Millstream Brewery beer flight if you like trying new microbrews. 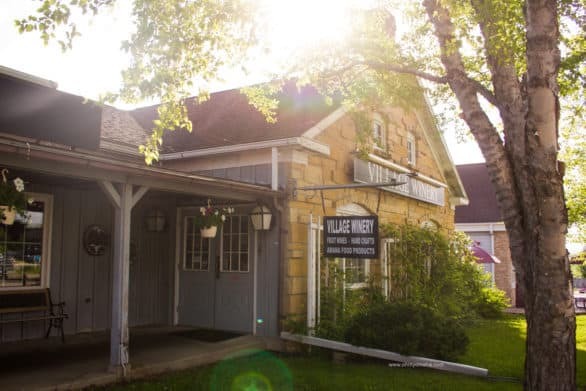 It’s Iowa’s oldest brewery and it’s just down the street form Ox Yoke Inn. Venture upstairs to peek at the small antique room. 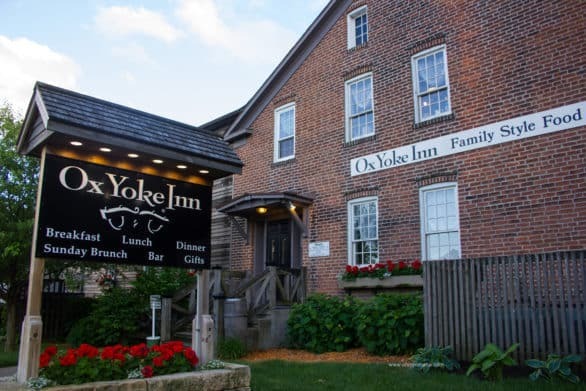 Everything about our dining experience at Ox Yoke Inn was wonderful. 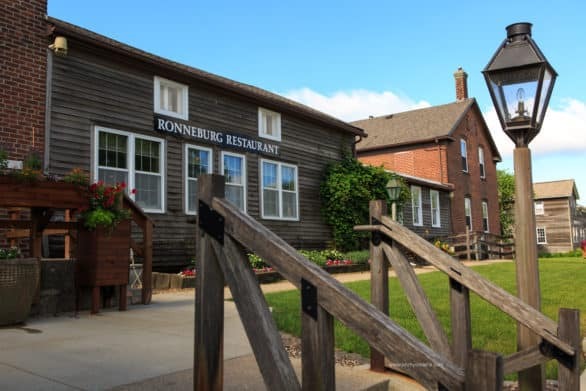 Breakfast is served daily at Ronneburg in Amana, Iowa. Be sure to try the pancakes. My family had a Sunday breakfast at Ronneburg, and of course, we had to go with the family-style option. It included the delicious Amana pancakes, a pile of bacon, eggs, toast, and fresh fruit. The thin pancakes were the clear winner of this meal. They were almost crepes save for those crisp edges. It’s hard to live up to the experience we had our first night, and Ronneburg was a bit of a disappointment because of the service. The server was friendly, but our meal was inexplicably slow, our coffee and water glasses sat unfilled for too long. We had to pull out a lot of our tricks to keep the kids entertained while we waited. 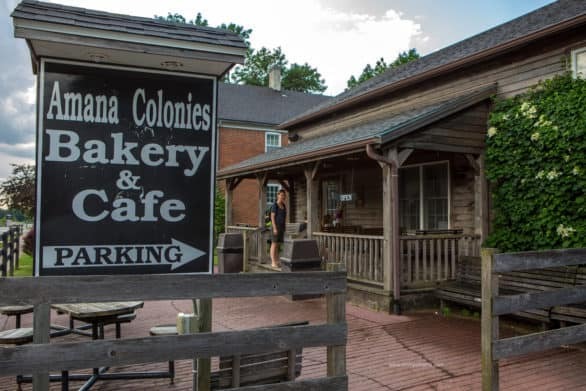 Satisfy your sweet tooth at Amana Colonies Bakery & Cafe in Amana. It’s presumptuous of us, but we assumed we’d find some amazing pastries in Amana, so we planned for one breakfast to be pastries. 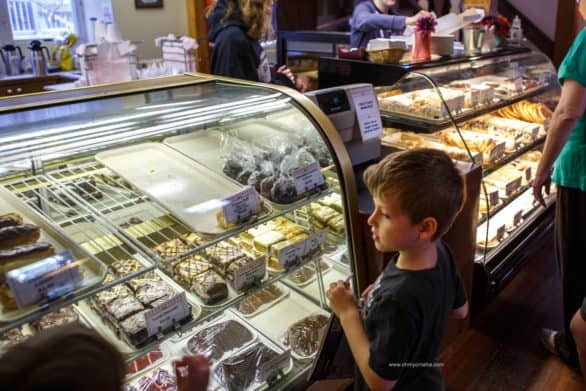 Amana Colonies Bakery & Café had display cases of tempting pastries and shelves of baked goods and treats. We ordered three pastries to split – apple strudel, chocolate éclair and a cinnamon roll – and coffee for the grownups. We ordered a maple cookie, too. The kids loved the éclair, though it was way too gooey for my liking. The flaky strudel was subtle and more to my liking. I think the cinnamon roll would’ve been better if it was warmed up, but as it was, it was OK. I wouldn’t make a special trip just for any of the pastries, if you wanted to know. It has a pleasant outdoor seating area, but the music just didn’t fit and definitely didn’t make me want to linger. Of course, the kids had no complaints, and I’m sure yours wouldn’t either. My kids are natural snackers, so if there’s a chance to sample a variety of food, they’re all in. The Amana Meat and Smokehouse had several different samples to try from jerky to cheese and crackers. We were in Amana Meat Shop and Smokehouse because I wanted to buy some snacks for the road and tasty souvenirs to bring home to family. While browsing the shelves, the friendly ladies working there started putting out samples. The kids tried three types of sliced summer sausage, a couple snack mixes and beef jerky. It was all so good. It’s worth a stop! For sweets, there are several sweet shops from the Chocolate Haus to the Amana Colonies Popcorn and Ice Cream Co. Mr. Wonderful popped into the Village Store and Fudge Factory, where they offered samples. He bought a small brick, and they sliced it in fours so we can each have a hearty taste. That was a sweet treat. Your turn: What was your favorite thing to order or sample when you visited Amana, Iowa? Just off Interstate 80 on the exit for the Amana Colonies in Central Iowa, families will see the huge sign for Wasserbahn Waterpark. We were expecting a laid back weekend exploring a National Historic Landmark – who knew there’d be waterslides involved. 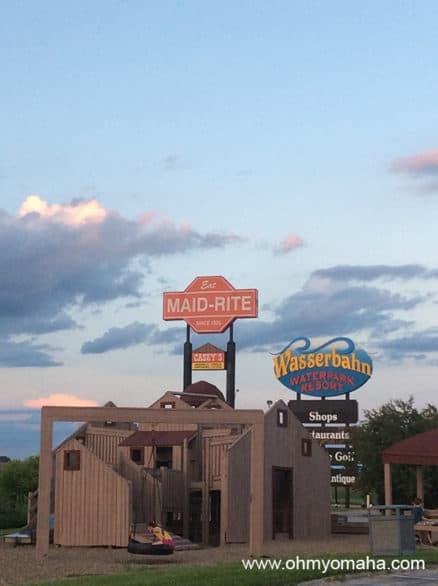 You can’t miss the Wasserbahn sign from Interstate 80. 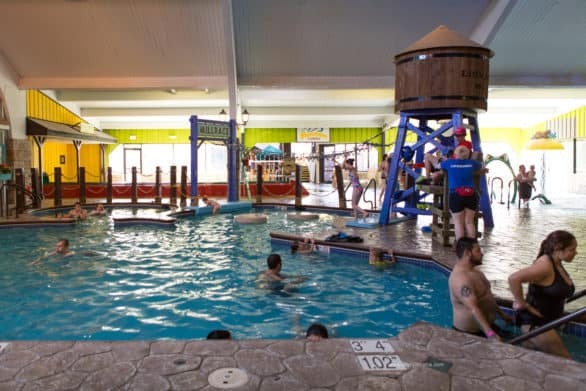 In an area with a handful of B&Bs and motels, the Ramada can draw a lot of families simply for its waterpark. It’s great, with three water slides, an area just for youngsters, a whirlpool and a charming Amana Colonies theme décor. There are two pool areas at the Wasserbahn Waterpark, plus a hot tub that children are no allowed in. The pool in this picture is the deeper of the two pools and it has a small whirlpool in back. You don’t have to be a hotel guest to go to the waterpark. It’s $10 for swimmers not staying at the hotel, and $5 for non-swimmers. If you are staying at the hotel, it’s easy to upgrade to the water park package. My kids would have been content only going to the waterpark and skipping everything else, if I let them. The shallow kids pool included a waterslide, fountain and waterspouts to play with. There are locker rooms there, as well as an arcade. I think you can order food and drinks to the waterpark but I didn’t see anyone do that, save for the lifeguards who were dining on pizza when we went on Memorial Day. Keeping with the kid-pleasing theme, the hotel also has a putt putt golf that’s included with your stay. Non-guests at the hotel can play for $3 per person. Mooch and Mr. Wonderful playing putt putt in Williamsburg at sunset. There were water features my son managed to send his ball into, and playing at dusk meant we caught a pretty sunset and enjoyed the fireflies that came out to play. The course was a bit rundown and one hole was out of commission. Even so, my kids laughed often and enjoyed the simple experience with us. There’s also a wooden playground my kids liked. It’s a good place to burn off additional energy. 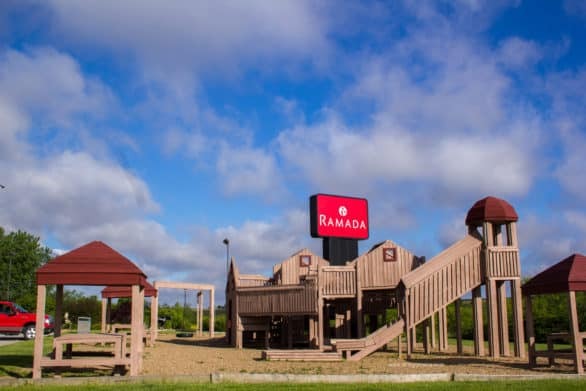 The wooden playground at the Ramada in Williamsburg, Iowa. On the weekends, they screen recent movies in a conference room. We watched “Zootopia” on our first night. The screen was small and the room was hot, but we laughed and we enjoyed the free activity with the kids. That’s all the good stuff. The hotel does have a downside. It’s in need of some updates. While the pool area looks fresh and new with bright colors, the halls of the hotel were dark and dated. The rooms were comfortable but not anything to write home about. Our room had a mini fridge and coffee maker, and a TV with cable. The large map of the Amana Colonies at our hotel. You can see the “You are Here” arrow indicating the hotel’s proximity to the National Historic Landmark. Obviously, a big draw is the nearby Amana Colonies. Read the recap of our trip here. But you’re probably wondering about Williamsburg and what’s right by the hotel, right? Across from the hotel is a little shopping center with the Village Winery and an art gallery. The winery offers free samples – in case your family starts getting on your nerves. Mine would never do that. There’s also a Maid Rite and Godfather’s Pizza there. The Village Winery is across the parking lot of the Ramada Inn. There is a restaurant in the hotel, but we did not dine there. A short distance west of the hotel is the popular Williamsburg outlet mall with popular outlet stores for places like Gap, Columbia and Ralph Lauren. 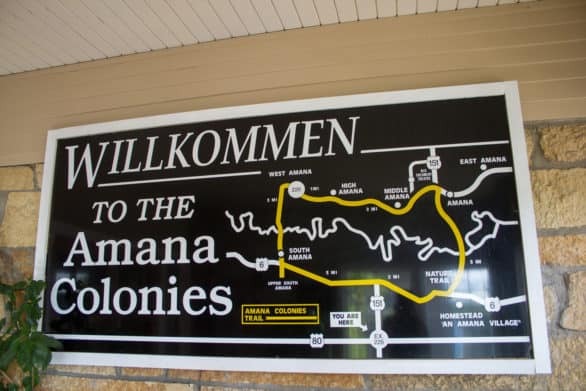 About 10 miles north, you’ll hit the Amana Colonies Trail loop where you can visit the area’s main tourist attraction. In case you’re wondering, I timed it, you can get to one of Amana’s popular family style restaurants in about 15 minutes. 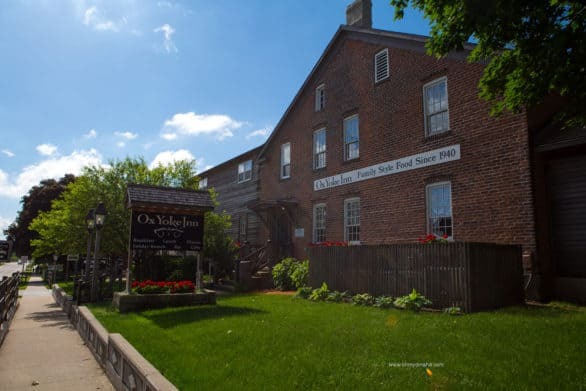 You won’t mind the drive from the Ramada in Williamsburg to the Amana Colonies. The farmland is serene and beautiful. East of the hotel is Coralville and Cedar Rapids, if you want a city experience. Southeast of Williamsburg is Kalona, a town known for the Amish population surrounding it. Amana Colonies is one of the biggest tourist attraction in Iowa, and being only about 3½ hours east of Omaha, it sounded like a good weekend trip for our family. We spent two nights in nearby Williamsburg, making several trips to the towns of Amana Colonies (there are seven). You could easily do it by staying one night, but you’d feel a little rushed. And there’s no rushing things when traveling with kids. My family’s stay was hosted by the Amana Colonies. The visitor’s center recommended several places to visit, and they helped me pick a weekend to visit when there was a festival. Here’s what I dreamed of doing. Now see what we actually managed! “I’ll take one of everything.” My son was an awe of the pastry display at Amana Colonies Bakery & Cafe in Amana, Iowa. 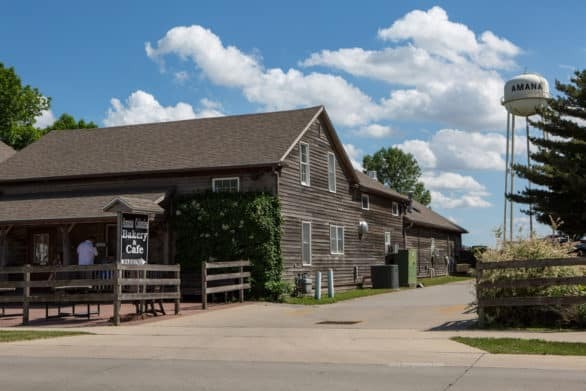 When researching where to eat in the Amana Colonies, there were three biggies that kept being mentioned in blogs and travel shows: Ox Yoke Inn, Ronneburg Restaurant and Colony Inn; all located in Amana. We made it to the first two. All three serve family-style meals, a vestige of the colonies’ past when they had a communal way of life. No homes had kitchens back then; instead they all dined together on meals made by women in the kitchen houses. Ox Yoke Inn is located on the main drag of Amana, Iowa (also known as 220th Trail). 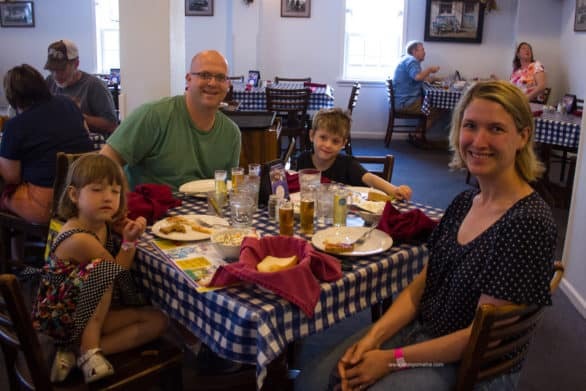 Our first dinner on the trip was at Ox Yoke Inn, where are fantastic waitress, Rhonda, explained a bit of the area’s history and why dinners are served family style there. We ordered the Family Banquet Feast to really start the gorge-fest vacation off on the right foot. It came with bread and homemade strawberry jam, two cold salads, fried chicken, roast beef, ham, green beans and the best buttery potatoes ever. We were stuffed, but still ordered a dessert to split. They’re known for their pies, so we tried a chocolate pie. We went back the next day to buy strawberry jam for us and for gifts. It’s that good. Update:We never gifted the jam. We’ve been hoarding it. Breakfast is served daily at Ronneburg in Amana, Iowa. Don’t skip the pancakes. We had two breakfasts in Amana Colonies: Another family style affair at Ronneburg Restaurant and a variety of pastries at Amana Colonies Bakery & Café. Ronneburg’s breakfast included some delicious Amana pancakes, so thin they were borderline crepes. The service was slow despite not being terribly busy. Amana Colonies Bakery & Cafe was a cute little place with outdoor seating. There isn’t much for savory breakfast options, so this is for those with a sweet tooth. Walk around Amana and you’ll find places doling out samples. I didn’t make it to many of them – you know, the whole “traveling with kids” excuse. 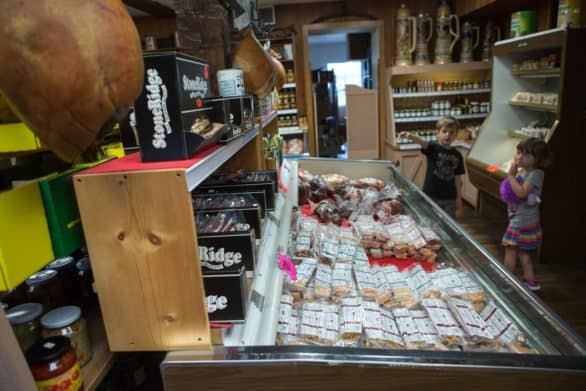 There’s a place to taste different flavors of fudge, or if you’re a meat eater, head to our favorite, the Amana Meat and Smokehouse (don’t skip the summer sausage and beef jerky there). Samples at the Amana Meat and Smoke House included delicious summer sausage, beef jerky and some snack mixes. A couple of our meals were not in Amana – there’s only so much family style my stomach can handle. 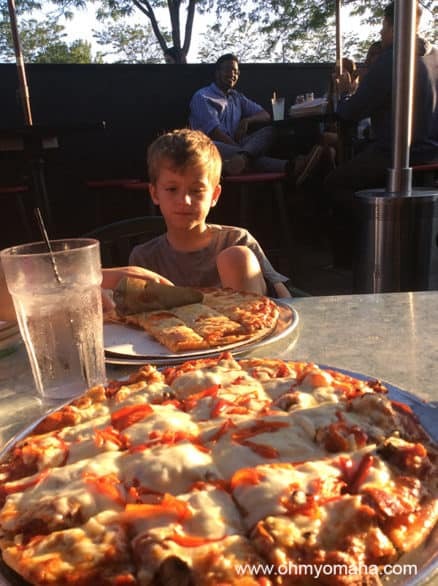 We ventured one evening to Coralville to try some pizza at The Wig and the Pen. It’s about 20 miles east of Williamsburg. Farley contemplating another bite of thin crus pepperoni at The Wig and Pen in Coralville, Iowa. Our other meal was an ill-fated trip to Kalona to see the Amish community. We went on Memorial Day and nearly everything was closed…save for the Mexican restaurant. This is what typically happens when I try impromptu outings. While we didn’t get to sample any Amish foods in Kalona, Iowa, we did spot the traditional mode of transportation for the Amish community. Kim’s note: Our Mexican restaurant fiasco in Amish country is why I feel the need to overplan trips – no surprises. My flight of Millstream Brewing Co. beer was in the cutest beer mug ever at Ox Yoke Inn. 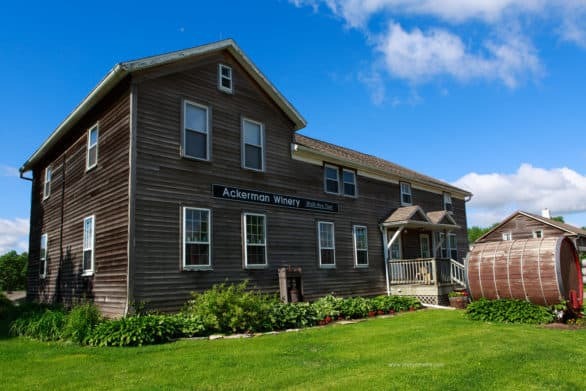 For being a small town Amana, in particular, has its fair share of wineries (four), as well as Iowa’s oldest microbrewery, Millstream. You can find wine all over Amana, but if you’re visiting with kids, you can just day dream about visiting them all. 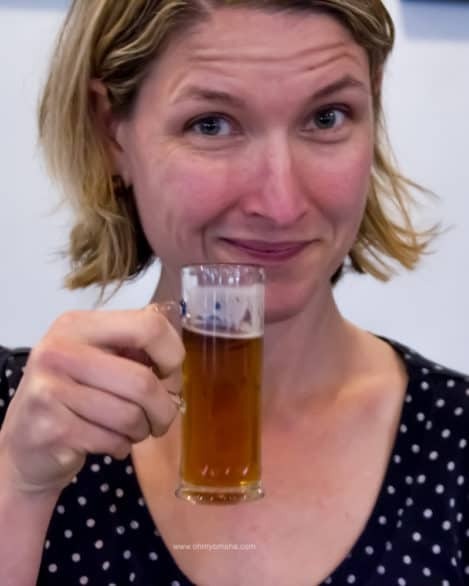 If you enjoy microbreweries, don’t miss Millstream. I tried a beer flight at Ox Yoke Inn – all three were smooth, but my favorite was the Schild Brau Amber. 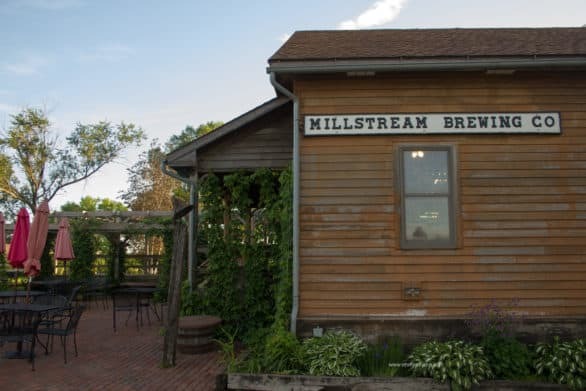 The Millstream Brewing Co. in Amana, Iowa, is the first microbrewery in Iowa. The brewery has a pretty nice patio that we didn’t get to enjoy. Like wine? Iowa wines are on the sweet side. I sampled a few at the Village Winery near our hotel in Williamsburg, the Ramada Wasserbahn Waterpark. I tried dandelion wine and peach wine. Mom got a 10-minute break by “shopping” in the Village Winery next to the hotel in Williamsburg. By shopping, I mean wine tasting. The Amana Colonies are a National Historic Landmark. It’s a picturesque set of towns that reflect the pride citizens have in their Amana heritage. Everything is well maintained. Nearly every street in Amana, Iowa is straight out of a storybook or how I envision every village in Germany to look like. You can do the 17-mile loop on the Amana Colonies Trail to see most of it and stop for tourists attractions. With kids, though, a scenic car ride wasn’t going to be leisurely. We had to move with purpose. We drove by most picturesque sites and tourists attractions when taking the 17-mile loop through the Amana Colonies. Shopping. I use this term very loosely. 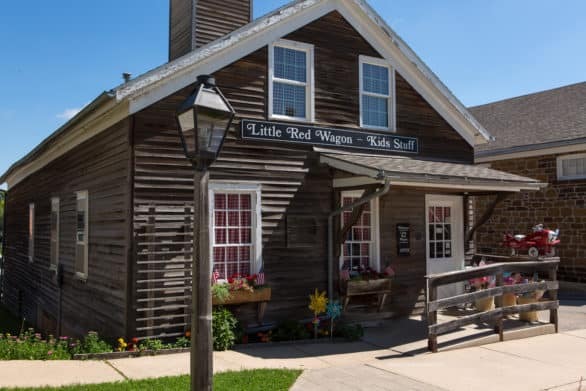 We shopped in a Little Red Wagon toy store, a book store and a the general store in Amana. The kids got some toys in Amana and, in Williamsburg, we got a bottle of wine and some beer. My kids enjoyed the Little Red Wagon toy store in Amana, naturally. Photography. We took gorgeous photos of the scenery. If it couldn’t be snapped in 2 minutes, it wasn’t going to happen, though. How this for Iowa farmland? The area around the Amana Colonies is straight out of a Grant Wood piece. Go back in time. We went to the Iowa Renaissance Festival held that weekend in Middle Amana. Kim’s tip: Never mention it’s your first Renaissance Festival. You’ll be called a faire virgin for the rest of the day. 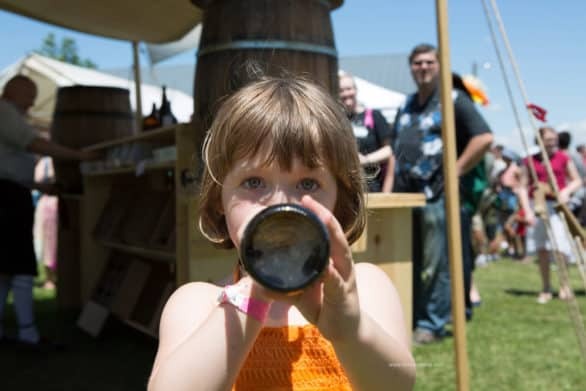 There are several festivals that harken back to another time in the Amana Colonies, including Maifest. Mooch was invited to be a part of a pirate play. The kid’s not shy. Play. The kids loved playing at our hotel. 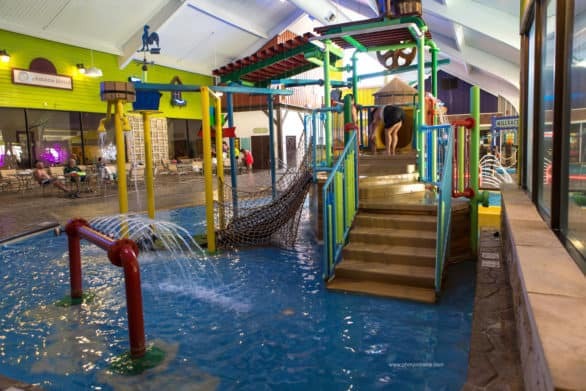 The Ramada had the Wasserbahn Waterpark inside, plus a wooden playground and putt putt golf outside. Guess what the kids enjoyed the most? The waterpark at the hotel. Nothing on our trip could compete with the draw of the Wasserbahn Waterpark at the Ramada in Williamsburg. Don’t even try. There are several bed and breakfast options in the Amana Colonies, and a motel. However, when traveling with kids, B&Bs might not be suitable. My kids want a pool and that’s all they ask for. Ramada Williamsburg Hotel and Wasserbahn Waterpark delivered mightily on the pool request, though, technically, it’s outside the colonies. The main draw of the Ramada is that it’s home to Wasserbahn Waterpark. It also has a large wooden playground and a putt putt golf course. We were provided two night’s stay at the Ramada plus complimentary admission to the waterpark so I can tell you all about it. 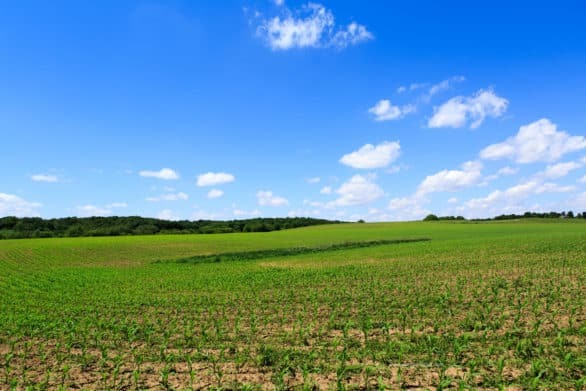 It’s located about 10 minutes south of the Amana Colonies Trail, at a convenient site just off Interstate 80. It’s a bit dated in the rooms and hallways, but that waterpark is a modern day attraction that is a lot of fun for all ages. Mooch and Mr. Wonderful playing putt putt at the Ramada in Williamsburg, Iowa. 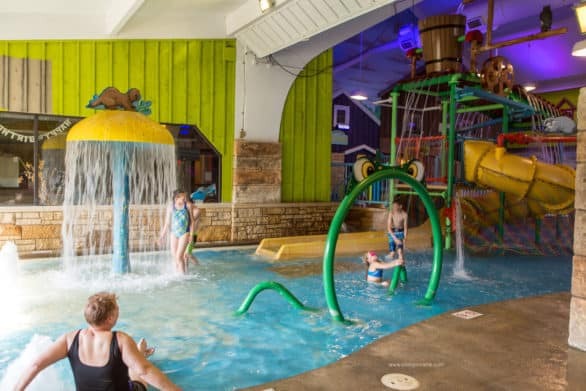 The hotel is ideal for families, and it also has an arcade, playground and an 18-hole putt putt golf course (give or take a hole under construction), as well as weekend movie screenings on a small screen. If it were just me and Mr. Wonderful visiting, I wouldn’t stay here, though. This is a kid magnet. I’ve grown used to excited kids and their chatter, but vacationing couples probably don’t want to hear that. Read my review of the hotel here. Farley doing a fine Zissou point signaling possibly another sample at the Amana Meat and Smoke House. 1. The kids did fine exploring Amana, especially places like the Amana Meat and Smokehouse where they could sample a lot of food. But, there was always the call to return back to the hotel pool (and the hotel’s putt putt golf course…and the hotel’s playground). Keep that in mind if you’re bringing really young ones. If you dream of pleasant strolls along a picturesque street, you’re better of taking a parents-only getaway. Mooch having a swig at the Iowa Renaissance Festival held at the park in Middle Amana. Relax. It’s cream soda. 2. 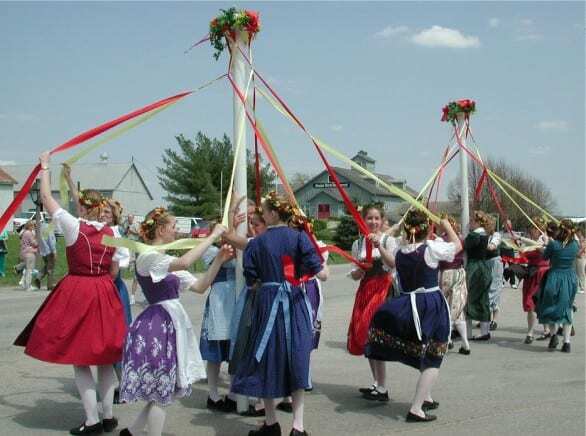 Attending one of the festivals in the Amana Colonies can be fun entertainment – there are annual ones, even, that tie in with the Amana and German heritage (hello, Oktoberfest!). However, it does eat up a huge portion of the day. 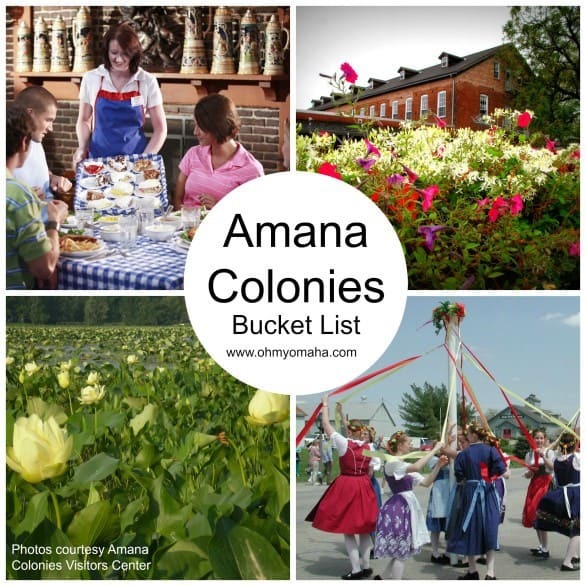 I didn’t make it to half the stuff I wanted to on my Amana Colonies bucket list. 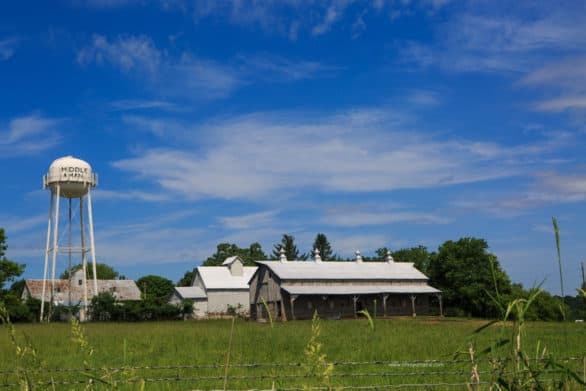 Plus, there was a number of things not on my list that I realized I wanted to do once I was there: Rent bicycles at the Amana Colonies Visitors Center, take a culinary tour, canoe, walk a couple trail, and shop at the outlet mall in Williamsburg. I’ll just save those things for a kid-free trip. Tip: There is plenty of parking in Amana. It’s small enough to park and walk everywhere if you’re in a regular walker. Finding the shops: Most stores and restaurants mentioned are in Amana. The main strip is found along 220th Trail, with the Amana Meat and Smokehouse and Millstream Brewing Co. a short walk from it (north on 45th Avenue and South on 48th Avenue, respectively). We’re kicking off summer with checking off an item from the authority in family travel: the book “500 Places To Take Your Kids Before They Grow Up.” (It’s only available used now, so for a similar book, look at National Geographic’s “100 Places That Can Change Your Child’s Life”) What sort of incredible adventure could it be? We’re going to explore the Amana Colonies in Iowa where some things haven’t changed much since their start in 1855. Here’s what I’m looking forward to doing when I visit with my family the national landmark next month on a hosted visit to the region. As always, time is limited and my bucket list know no bounds of time, money or family patience. They’re famous for tasty German food and family-style dining. The names that keep popping up on blogs and in magazine stories include Ox Yoke Inn (gotta try the rhubarb pie, though the place was featured on Travel Channel’s “Food Paradise” for the Pork Paradise episode), The Colony Inn and The Ronneburg Restaurant (word is, they have the best herbed cottage cheese); all three are in Amana. 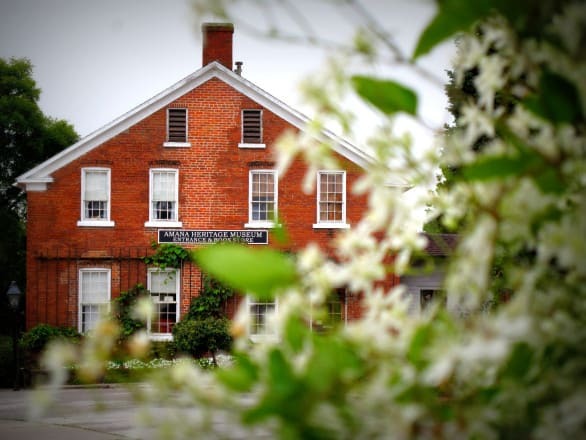 Curious what kids will eat in the Amana Colonies? 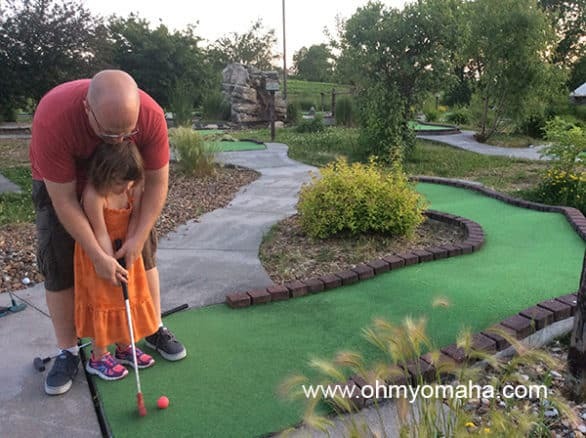 Read this post about Dining with Kids in Amana. 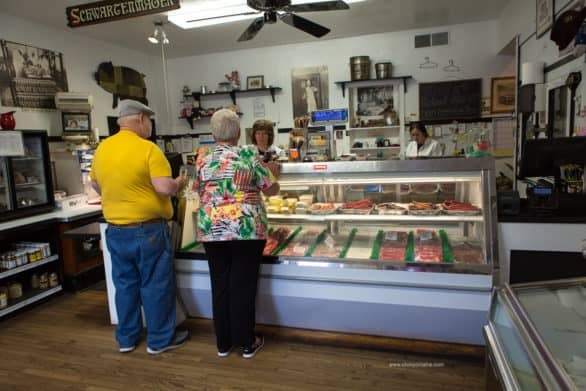 Midwest Living tipped me off to a few must-try foods there, including ham, bacon, sausage and cheese made at Amana Meat Shop and Smokehouse in Amana (I may skip trying the Schwartenmagen, or head cheese) and baked goods from Hahn’s Hearth Oven Bakery in Middle Amana. Then there’s the Chocolate Haus with a 100-year-old recipes – they have to be good if they’re still in use, right? And I can’t resist visiting a state’s oldest brewery, so lucky me, Iowa’s oldest brewery, Millstream Brewing Co., is in Amana. Or we can go to one of the many wineries (I’m not picky). There are a few museums in the area that sound like my kids will enjoy. 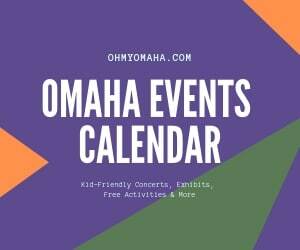 There’s Opa’s Tractor Barn and Museum in West Amana that covers farming history and also happens to have the colony’s largest bowling ball run. In South Amana, there’s the Mini-Americana Barn Museum with a collection of miniature replicas. Our first stop should probably be the Amana Heritage Museum in Amana, though, with the communal kitchen and copper shop to see. But, Amana Colonies has some shops that are a throwback to a different era. From the looks of it, I’d like to start at the High Amana General Store located in High Amana. We can shop classic toys at The Little Red Wagon Toy Store. I heard Edelstein Treasures is another shop to see… for dinosaur bones and a chance for kids to pan for their own treasures. Amana, to me at least, makes me think of appliances, but there are craftsmen of different trades here to watch in action. 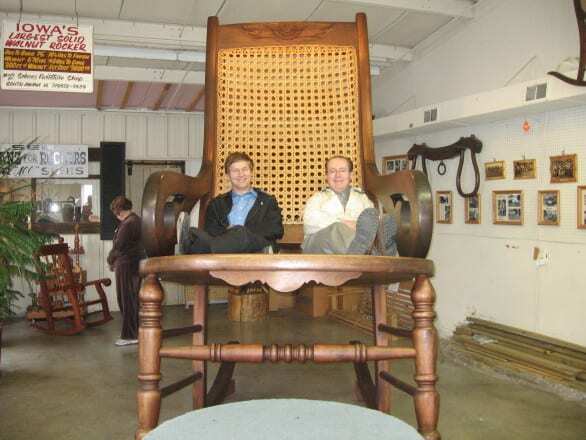 Some spots we can check out include Amana Woolen Mill and the Amana Furniture and Clock Shop. This one’s more for the kids, really. I’ve seen enough photos of kids at The Broom and Basket Shop in West Amana to know my kids will want to climb up and have a rock. I heard there’s a marble run at the shop that is big with kids, too. You have to time your visit to catch a show that’s right for you – especially when traveling with youngsters – but wouldn’t it be cool to see the Old Creamery Theatre Co. perform? Several itineraries mention traveling the Iowa Valley Scenic Byway, which sounds nice to me but I can already hear the kids complaining. 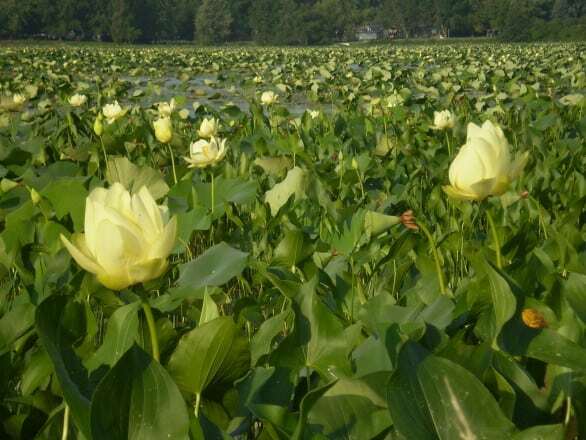 I think we’d all enjoy a hike better, and the visitors center recommended we check out Lily Lake. 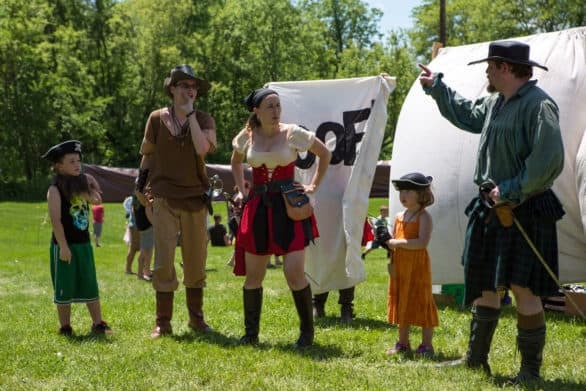 This trip won’t work out for seeing one of their most popular festivals – Maifest, but it is going to time well for us to be at the Iowa Renaissance Festival held in Middle Amana Park. I’ve never been to a Ren Faire so it ought to be interesting. Update: It was fun! Read about our experience in Amana Colonies and visiting the Renaissance Faire here. A new festival starting in July this year is called Kinderfest, and it is what it sounds like, a kid-friendly festival. Christmas also looks like a lovely time to visit. 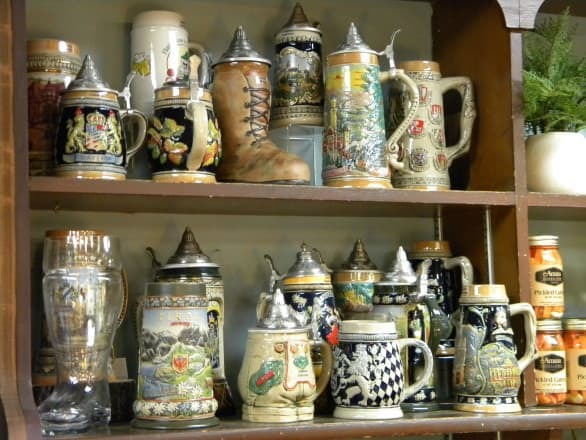 And, let’s be real here, wouldn’t it be fun to be in the Amana Colonies for Oktoberfest? Your turn: What am I missing from this list? What foods do I need to order when I’m there? 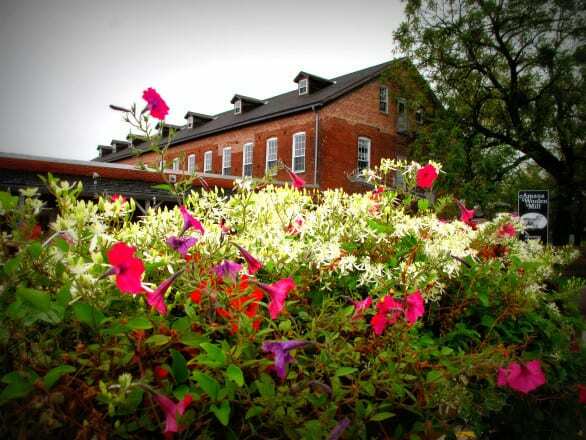 Have a favorite winery? Share your favorites from the Amana Colonies in the comments below! Wondering what we saw in the Amana Colonies? We had a whirlwind of a weekend with the kids in Amana Colonies. 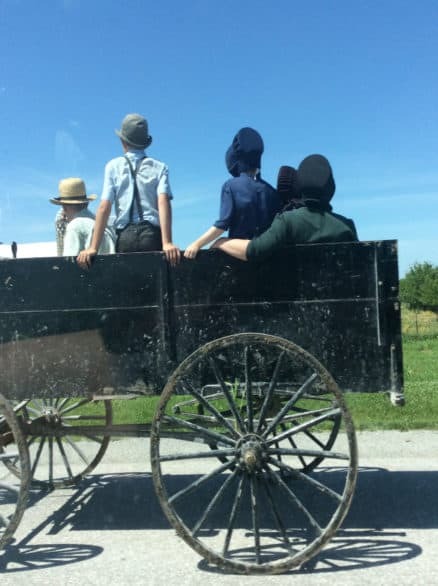 Read all about Visiting Amana Colonies With Kids in this post.